Wildlife require water just as we do. Water is essential for life. Songbirds use it for bathing and preening; waterfowl and shorebirds for finding food and escaping predators; and muskrat, mink and beaver for every part of their existence. Providing water can be as simple as a bird bath or small fiberglass pond or as complex as the construction of a large, excavated wetland with an artificial or clay liner. If you have an existing water source, you are fortunate. 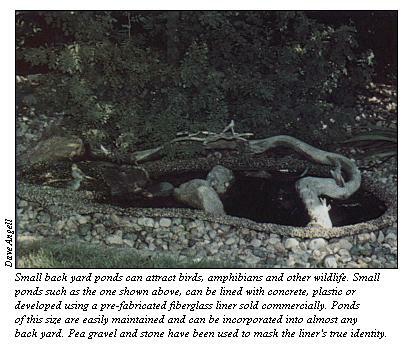 A small, natural wetland or creek is ideal to provide water for wildlife and should be used if available. If there are no natural wetlands and you have the space, water source and finances to create a wetland, construction is an excellent route to go. Artificial water can be defined as water that does not naturally maintain itself from precipitation and runoff. It is an alternate to natural water and will be a choice that many will be forced into making because of limited space. Small artificial water sources like fiberglass ponds and bird baths are less expensive and require less space. Downfalls are that they require periodic maintenance and provide limited plant growth and living conditions for most other aquatic life. The most simple method of providing water is a bird bath. The structure need not be elaborate, an old pie tin works as well as a prefabricated concrete structure. Make sure the water is no deeper than three inches and that smooth bottom baths are enhanced with some type of structure or objects for perching. To cut back on maintenance, simply hang a garden hose above the bath and allow water to drip into the bath at a slow rate. Birds also require water in winter. 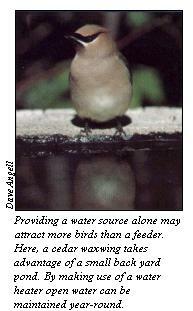 By providing open water, you may potentially attract more birds for viewing. There are a variety of options including dog and poultry water heaters as well as commercial water heaters designed specifically for bird baths. It is important that you always keep placement in mind both for the bird's safety and for your viewing enjoyment. Keep the bird bath near a favorite viewing location but at least ten feet away from vegetation or other cover. This will help in preventing neighborhood predators such as domestic cats from killing birds. 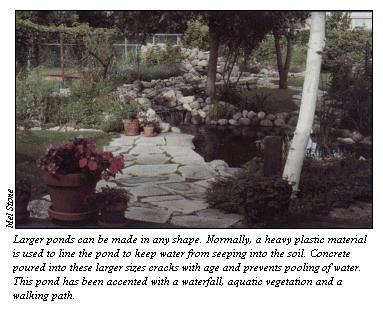 Small backyard ponds with artificial liners are another method of providing water for wildlife. Choose a location which receives sun part of the day to stimulate plant growth. Begin pond construction with a pre-fabricated fiberglass shell or similar item such as a kid's wading pool or old washtub. A good option to both of these methods is utilization of 20 mil black plastic. Sources for fiberglass liners are located in Appendix E.
Finally, you may choose to use concrete. Concrete is a little more difficult to use but can be poured in any shape desired and will last for many years without maintenance. A drawback is that the appearance may seem less natural and may crack if made too large. If you begin with a child's wading pool or washtub, it should be lined with 10-30 mil black plastic. This will insure water does not leak from the pond and will give a more natural background color than that of a wading pool or other structure. After fitting the liner, field stones, flat rocks or timber can help hold and hide the edges of the plastic liner. Adding soil over the top of the positioned liner will allow future planting of aquatic vegetation. An alternate method to lining the entire pond bottom with soil is to put aquatic plants into pots and then submerge the pots in desired locations within the pond. Stabilize pots with rocks or other means to prevent tipping. Plan to have enough aquatic plants to cover 30-40 percent of the surface area. There are three basic categories of aquatic plants: emergents, floating, and submergents. Emergents are plants that root in the bottom and grow out of the water including bulrush, cattail, smartweed, giant reed grass and arrowhead. Floating species are those which root in the bottom and have leaves that float on the water's surface like water lily and some duckweed species. Finally, submergents are those which grow entirely underwater and include plants like pondweed, coontail and elodea. Other plants that prefer moist soils adjacent to wetlands include species such as wild mint, phragmites, reed canary grass, giant goldenrod, prairie dock, prairie cordgrass, and marsh milkweed. A diversity of plants will help attract wildlife and insects. To keep water from stagnating, it may be necessary to add additional water during hot summer months when evaporation is high. The addition of a pump to circulate water is recommended and will aid further in helping prevent stagnant water and excessive algae growth. Algae growth which cannot be controlled may require chemical control, but only as a last resort. If you are more ambitious, raise the level at which circulated water returns to the pond. A waterfall will be formed, a sound which many times attracts additional birds. Waterfalls also add more variety and beauty to your pond. Again, rocks can be used to hide components used in the construction of your waterfall. Provide areas for birds and turtles to make use of your pond by adding log perches or a rock island. Creating a sandy, gravel beach in one corner can provide the grit birds require for digesting food. A sandy substrate also makes looking for wildlife tracks an educational experience. After you have completed all the necessary preparations, fill the pond with water. If using tap water rather than well water, let stand for a week to let chemicals like chlorine dissipate. You may choose to see if plants will come naturally. This could occur through transfer of seeds on bird's feet or from their droppings. Another method to introduce potential plant and invertebrate life is to scoop muck from and existing wetland and transfer it to your pond. Keep an eye on your pond often and log the plant growth as a family activity. Before winter arrives, drain the pond to prevent cracking of the liner. Those who have the space can create a larger wetland which can accommodate a more diverse array of wildlife and aquatic species. These wetlands can be of any size, and only limited to you budget and water supply available. The budget will be driven by two up front costs - earth moving and a pond liner. Earthmoving is a job that will probably need to be contracted to an experienced earthmover. There are local contractors you should contact who have had experience with this type of work. Generally, your wetland should be planned to have both a shallow area and a deep area. The deep area can either be in the center with side slopes which gradually get shallower around all sides or a situation much like a swimming pool where one end begins with a few inches of water and culminates in a deeper end. Depending on your desires, a deep end can be anywhere from three feet to over twelve feet deep. Twelve feet is the depth at which fish can normally survive over the winter. Remember that a variety of depths is the most beneficial in attracting and sustaining the largest variety of animal species. How to hold water is your next consideration. A detailed soil analysis of the proposed location will reveal whether or not you are fortunate enough to hold water without some type of liner. Some soils will not naturally hold water, while other with a higher clay content will. Reference a county soils map available from the United States Geological Survey or have your soil tested to determine its potential to hold water. There are basically two options available for soils that will not hold water. One is to use a naturally occurring clay which can be purchased from various sources. Clay is packed along the bottom of the pond, anywhere from a few inches in depth up to a foot, to seal wetland's bottom from leaking. This option requires that pond banks be fairly gradual because clay will not pack on steep side slopes. Clay can be an advantage because it will allow plants to grow naturally and provide a more realistic setting. If clay is not available, or too expensive to haul in, a plastic liner will function to maintain water. Manufacturers of the liner will require accurate dimensions of the excavated pond, including depths, to insure a good fit. Liners of this thickness are heavy and fairly expensive so estimates of both the clay and plastic options should be explored before making any decisions. When planning your pond, take into consideration the source of water. Ideally, natural spring runoff from snow melt and seasonal rains will be enough to keep the wetland charged throughout the year. If there is no existing area which gathers water for a wetland (watershed), it may not be a good choice for a pond location unless you can use an alternate source of water. One alternate source of water is water which can be tapped from your own well, either a well dug specifically for your pond or an existing well used for other purposes. If the well is being dug specifically to maintain water levels in the wetland, it can be put in close enough to allow water to trickle into the wetland over land. Engineering this type of setup will create yet another type of wet area termed a bog. A bog is waterlogged, spongy ground that is not covered by water but remains wet all year round. It will establish its own specific plant community of species such as sedges. This area will be a natural attractant for frogs and aquatic insects which will in turn entice other wildlife to visit during feeding periods. Larger wetlands have the capability of providing homes to many wildlife species. Depending on the location, wood ducks or other waterfowl may be lured to your water. If a pond contains minnows, crayfish, or a good supply of frogs, wading birds such as the great blue heron may be observed while in search of a good meal. 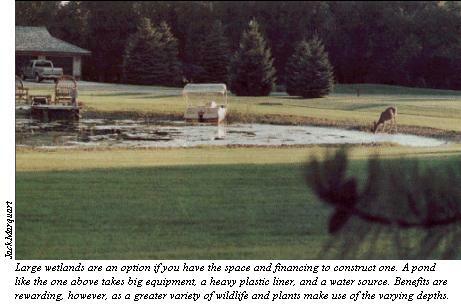 Increasing the diversity of a wetland can be accomplished by providing structure on the sides and bottom of the pond. Structure can consist of rocks, logs, brush piles or any materials upon which aquatic organisms can attach or hide. Placement of structure can be controlled more if it is done before the wetland is filled with water. This is also the time to dig in any above water perches that need to be anchored into the bottom. Along the bank, logs and rocks should be used to provide more habitat and hiding places for frogs and salamanders. These structures also serve as perches for songbirds, wading birds, turtles and waterfowl. As mentioned previously, plants will add greatly to a wetland both biologically and aesthetically. Plants can be started by gathering and introducing seeds, spreading several shovelfuls of muck gathered from an existing, mature wetland or by planting adult wetland species purchased from a greenhouse. Plants may also be gathered with permission from a private landowner who has wetlands. A wetland will attract insects and provide a rich source of food for many wildlife species. By providing artificial homes for waterfowl, bats and bluebirds, or loafing areas for geese, they may choose to take up residence in the area for the entire season. Techniques for building and setting up living spaces will be covered in upcoming sections. Wetland construction has a price but it is sure to please any landowner. You will be fascinated to see the transformation toward a more diverse wildlife habitat right in your own back yard.